January 14 was a great day for N.E.S.T.! 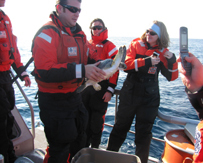 The US Coast Guard station at Hatteras Inlet provided transportation for 11 turtles to the warm waters of the Gulf Stream. Before departure, they were all given identification numbers and tagged for noting in future research. Only one of our releases in the past few years has stranded again….hopefully a good sign! The timing of this release was great since only a few days later four loggerheads were recovered-this time from the ocean rather than the sound or inlets. One had to be transported to Virginia due to lack of space in our rehab facility— loggerheads must be physically separated. The three we accommodated are healing well and taking nourishment. One weighs 136 lb.! Sixteen of the turtles boarded elsewhere were ready for release by January 26. On January 27, they returned to spend the night at our aquarium. The next morning they were loaded onto the charter fishing boat, Phideaux, captained by Jaime Reibel. Within 2 hours, they were swimming in the Gulf Stream. Thanks Jaime and crew!